The Media Economy analyzes the media industries and its activities from macro to micro levels, using concepts and theories to demonstrate the role the media plays in the economy as a whole. Representing a rapidly changing and evolving environment, this text breaks new ground through its analysis from two unique perspectives: 1) Examining the media industries from a holistic perspective by analyzing how the media industries function across different levels of society (global, national, household, and individual); 2) Looking at the key forces (technology, globalization, regulation, and social aspects) constantly evolving and influencing the media industries. Building on the contributions of the original text, this Second Edition provides new references and current data to define and analyze today’s media markets. To understand the role of media in the global economy, the insights included here are crucial for media students and practitioners. What is The Media Economy? Alan B. Albarran is professor of media and the director of the Center for Spanish Language Media at The University of North Texas. He has extensive experience as an editor and author and is widely recognized as an international scholar in the area of media management and economics. He is former editor of the Journal of Media Economics and the International Journal for Media Management. Whether teaching at the graduate or undergraduate level, you will find everything you need in just one book. Key definitions, in-depth explanations, research, and case studies are provided in each chapter. Unlike many books on media management or economics, this one will stay current and at your fingertips for a long time. As a Media Industry researcher this is a must read. "The Media economy" explains all the key drivers and concepts associated with how the media economy functions. Through concrete examples and figures, the author was able to this piece into a compelling read that I have recommended to all my students and colleagues. Ethel Pis Diez, Media Management Professor, Universidad Austral, Argentina. Doctor Albarran is one of the most important scholars in US, Europe and Latin America because of his contribution to the field of media economics and media management. This book must be required not only for professionals and students of Communication, but for anyone in business, marketing and other areas related to digital economy and cultural studies. "The Media Economy provides us with a much needed transition from the study of media economics to the understanding of the media economy. The book successfully captures the essence of the holistic media economy by a clear, attractive, and comprehensive macro-view of communication markets and industries. For courses covering the media industries, The Media Economy should be required reading. 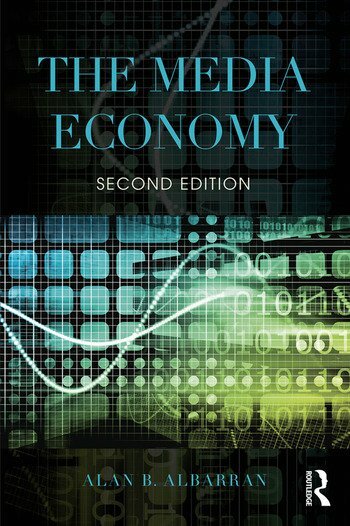 As a succinctly written textbook, this second edition of Media Economy provides its readers with the most updated technology trends and their impact on media economy. I particularly like the global and multi-platform approach of the book from beginning to end which characterizes the present and future of media economy.